We need to fix the “solved problems” crisis in home health care. At the start of Health Foo* in December, everyone introduced themselves in 6 words or less. Row by row, person by person, 100+ people talked in turn. In the back row, nearly the last to speak, Laura Baldwin stood and said, simply, “Dignity at the end of life.” I made a beeline to introduce myself. She shared that she is a caregiver for her father, who has Alzheimers and requires constant, intimate care, including diaper changes. She described how difficult it is to turn over a 6 foot 3 inch man in bed, particularly for her mom, who is just 5 feet tall. One evening, a friend came for a visit to help out. 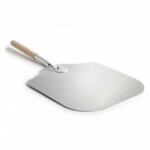 He watched as Laura struggled to turn her dad and then said, “Wait, I know what you need — a baker’s spatula.” He brought one over and showed Laura how to slip it under her dad and gently lift, using the leverage of the long handle to start the turn that she can’t manage on her own. It was a revelation. Laura was so excited, she shot a quick video of how to use the spatula so her sisters could benefit when they came to care for their dad. They weren’t happy about the video — it showed their father in such an undignified position — but they were glad to learn the new trick. When Laura told me this story I was reminded of the conversations I’d heard at a Moebius Syndrome conference, where parents shared tips for coping with children with facial paralysis and less-than-dexterous hands. One mom lamented that she’d gone months before coming up with an idea to cut a hole in her baby’s onesie for her feeding tube, eliminating the uncomfortable, wrinkled t-shirt problem that was waking her up. She learned later that it was a well-known trick, but nobody had told her to connect with other Moebius parents and so she’d never learned it. Another known hack is to stick a pen through a tennis ball or a rolled-up wash cloth so someone with dexterity challenges can write. The next morning, in front of a room full of people who have been, are, or intend to be caregivers for family members, Laura and I started talking about how many home health care tricks are out there, un-shared, un-publicized, and not spreading as quickly as they should. We filled a white board with examples and ideas. What I hope to do now is share some of those notes and continue the conversation, since the one-hour session was not enough time — and many more people have ideas than could fit in that room. Should there be a sort of “petting zoo” of home care technologies? Or a library model, so people can borrow things to try them out at home? What if, when someone searched for answers to a known health problem, just-in-time ads served up guides written by people dealing with that too? What is the role of the mainstream media? Could Good Morning America or the Today Show feature an “eldercare tip of the day”? Could there be an @instructables or Cool Tools for home healthcare? 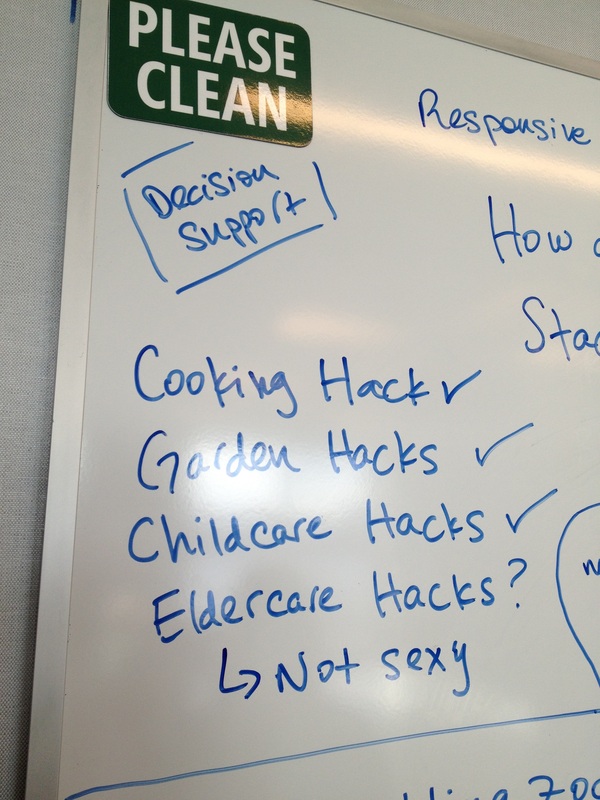 How about a lifehacker.com focused on caregiving? Or a print catalog for old-fashioned or newfangled home health care tricks and tips? What can we learn from the village-to-village movement? These stories make my hair stand on end. People’s lives are significantly improved by these simple hacks, shared by a peer or a professional, too often by chance or happenstance. Now: my request. Let’s gather ideas. Let’s scale this. Please share your ideas about how we can help spread “solved problems” in home health care. Are there organizations already doing this and I just don’t know about them yet? What’s the best way to connect people — the makers and the people who want to promote their work? All ideas welcome in the comments. * Health Foo is an event hosted by O’Reilly Media and the Robert Wood Johnson Foundation. The agenda is created on the spot by the attendees. For more background, read my post on the first Health Foo. 2018 update: The conversation around this post led me to start the Invent Health Initiative when I was the Chief Technology Officer at the U.S. Department of Health and Human Services. I maintain a list of examples of “home health hacks” and other ingenious medical and assistive device solutions on Wakelet. I love the work that you do. I have been having some conversations with Smart Patients about doing just this – organizing useful information that patients need to know, conversations that they are having with one another and sharing stuff that wouldn’t ever have a reason to come up in a clinical encounter but has tremendous value to the patient or family. It’s a way to be proactive in disease management, both in the traditional clinical sense and also in the more practical “good tools to have in your back pocket in case your 3yo goes on a random hunger strike” sense. You said it best at your MedX Live last week, “listen more than ask”. Listening to patients talking to other patients has incredible value that no one has really taken advantage of. Collecting and organizing these “hacks” gives clinicians and even advocacy organizations the opportunity to see what’s really important to their communities and then embrace and focus on that. Your idea — healthcare tip of the day — can be accomplished on radio in a 30-second or 60-second spot, at a relatively low cost, sponsored by a pharmaceutical company. The topics would need to be of general interest: Alzheimer’s care for instance but could refer to a website with tips for more specialized diseases. That’s a great idea — niche advertising for niche markets. And we all know that unfortunately we are facing a rising tide of dementia, so it won’t be a niche topic for long. 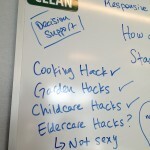 I searched for “eldercare hacks”, and this was the only hit. To prevent adult diapers from being flushed, take a rod coat hangar with plastic coating and a sturdy pair of pliers and fashion a trident-type fishook. One of the hooks goes in the back of the drain, while the other two stick out into the throat of the drain about 1″ to catch any fabric. This has minimal interference with normal function, and will catch on the fabric of the diaper. This may prevent a $500 plumbing bill. OK, that is a heck of a tip. Fits in with another theme dear to my heart: the “unmentionables” of health care. The stuff nobody talks about, like adult diapers and how you may want to give someone privacy in the bathroom but then they flush the diaper down the toilet. Thank you. That’s a great tip. I myself am a geriatrician and have a special interest in family caregivers. The most active eldercare forum I’ve found so far is at AgingCare.com. The caregivers there are giving each other all kinds of fantastic practical advice, but usually I don’t see it framed in terms of “hacks”. You might consider sharing your idea with them…I’m sure it would be so helpful to many of them. great post – just the other day I was getting the second pedicure of my life (although I may need to do that again soon) and the manicurist asked what I do. My usual response is that for many years I was a community-based palliative care nurse and now I work for PatientsLikeMe. Usually that all takes a bit of explanation but Denise totally got it – why, because she’s been a family caregiver. First for her mother in 2003 and more recently for her father-in-law. Both at the end of their lives with dementia. She talked about how much she learned from the first experience and how that helped her in caring for her father-in-law. She talked about the modifications she made to his pants using velcro and creative use of scissor cuts to the underwear so he didn’t have to fuss with the button and zipper to make it to the bathroom in time – but to make it look ‘right’ she even sewed the button back on. The alternative of getting him sweat pants – which everyone told her to do – just wasn’t acceptable for a man who would never have worn sweat pants when he was able to make his own decisions. She then said something delightful and it stuck with me all day, “I just MacGyvered it!” Denise reminded me of so many family caregivers I’ve met over the years who were MacGyver masters of creativity and problem solving with simple everyday ingredients and I had a very similar thought – we need to catalog these, we need an app for that! Yes! I use the term MacGyver all the time (along with the equally dated “that’s like putting your peanut butter in my chocolate”) and my younger colleagues look at me like I’m crazy. But you’re absolutely right. Caregivers are MacGyver masters. I love how Denise honors her father in law’s personal choices and figured out a way to make his pants work for him. Great post, Susannah. Your session with Laura was one of my faves! My hacks are all so random: using doll clothes for my preemie girls. Singing to my dad to bring back memories in music that seemed to be gone without tune. I will think of more to contribute, or of ways to categorize (meta!) — but meanwhile am honored to take even a tiny part in smoothing the way for others whose paths are more difficult than mine. Giving forward, giving back. Thank you for all you do! Thank you so much, Susannah, for writing about this! Family caregivers also have to practice using home care equipment and it can be a nightmare to practice on a caree (we use the term “caree” rather than “care recipient”). A hoyer lift, in particular, is awful. One of my bloggers who cared for her mom finally figured out how to use the hoyer lift by practicing with her husband in the sling. It was Christmas Eve and she wanted her mom to join in the festivities, which meant getting her mom out of the bed–and that meant trying to figure out how to use the hoyer lift. One of my bloggers practiced changing incontinence briefs on her sister so she would be comfortable changing her mom. Another blogger couldn’t figure out how to change the bed as her husband lay in the bed, dying. Oh my gosh, I had never considered the idea of caregiver theater — trying something out in rehearsal before you try it out “on stage” with your caree. Everyone, please click through and read the hilarious (because no one got hurt) post about the hoyer lift! 7) I have started to hack food preparation by making some meals a couple of Saturdays each month, for sure I’m not an expert but they have been tasty so far. 8) We have used old strollers to help Alexis ‘push’ – to help her walk when we don’t have her walker available. I would love to learn more hacks… necessity is the mother of invention. I’ve asked MakerNurse team at MIT if they could maybe start a MakerMom group (realizing of course that I am really trying to help MakerCaregiver, but MakerMom sounds cooler). Totally love this, love the conversation it will start. Most awesome way to start the week! Amazing tips and ideas — thank you! wow. It’s so hard to tell how to get these types of suggestions/hacks out there. There are so many disease-specific websites and support groups/forums that provide lots of advice, but as an instructor of patient advocacy, with some background in caregiving (taking care of two elderly parents myself!!! ), I find that information needs to be more centralized than that because some things just apply to caregiving overall (depending on age group) – like that lovely baker’s spatula for getting any patient out of bed who has difficulty. The Family Caregiver Alliance (www.caregiver.org) has a very, very short list of tips for caregivers that are submitted by other caregivers, so I guess they are in the process of building this out. But most of the material out there is really tools for caregivers to get support for themselves (financial or respite) or to learn how to navigate systems, not these great caregiving hacks, so this is a fantastic project. A website perhaps with an easy submissions section that would accept videos or drawings or written items describing the hack with a twitter/facebook outlet? Love the role of the media with the eldercare tip of the day, but I don’t think you should limit it to eldercare, since not all caregiving is done for eldercare…..some of these hacks would work on the disabled, people with ALS, and I’m sure we could learn a lot about caregiving from people who’ve been caregivers in the disabilities communities for a long time. Just throwing out some ideas there…. As someone who worked in the tech industry for years, I do like the idea of the stack overflow.com – yahoo answers is similar to this and people go there all the time and most of the disease specific orgs have some type of similar forum so lots of caregivers and patients alike would be familiar with this methodology….. Possibly my favorite hack: installing more than one toilet paper roll holder in the bathroom at reachable height. I also recommend keeping at least a dozen plastic garbage bags stashed at the bottom of garbage/trash containers to save time and effort. There’s more! I love this stuff!! This is all such great stuff. I have been a caregiver for 6 people over the last 20 years, as well as an Elder lawyer. And I see an even wider scope of the need to share practical information, which is dealing with insurance, medical providers, billing of any kind, hired help, etc. I choose to share all my crazy experiences at my website : You just have to Laugh, just to keep going. I guess if we all tweeted our tip of the day it would help. Hired help! People have no clue about the difficulties involved with hiring reliable, responsible help. After I moved, the woman I worked for (who became a dear friend) hired and fired aides every other month — no exaggeration. Even though I was no longer geographically proximate, I continued to do whatever I could do via computer. Still, that did not solve the problem of finding people willing and able to simply take out the trash and fix a simple meal. Things got so bad that I drove 3.5 hours to spend 2 hours cleaning and fixing what a parade of aides couldn’t manage to do for nearly a year. Pitiful. I know.. Yet I have been very,very fortunate lately and found an amazing agency in my area that has wonderful, dependable kind caregivers. I know how lucky I am. You might like a chuckle at http://www.cathysikorski.com….where caregiving is comedy. Bless all the caregivers. Props Susannah for bringing up StackOverflow. The makers have a more general Q&A engine called Stack Exchange that can be used for any purpose. There is a fitness version out there so you can get an idea of how a tip-sharing site might work. Found traces of people discussing health/medical Stack Exchanges, but there doesn’t seem to be one. Of course, you’re talking more about a caregiver or patient hack type version. I have to give credit right back to the Health Foo group for the Stack Overflow idea, but yes, it’s a really good parallel. I’ll explore that link and hopefully others will too so we can discuss it. My hope is that there is a platform that is so easy to use, anyone can contribute. The problem I have, is that there isn’t really any web sipport for caregivers of elderly in “good” health, just old and frail. I care for my gram, who just turned 99 Feb. 9th. The only meds she is on arevfor thyroid, and Tyleol for arthritis. Just recently she also started on Duo-med & ahlbuterol, for thick mucus & resulting cough. She still walks slone with a walker, feeds herself etc. She is just very frail and needs someone 24/7 to cook, clean, laundry, and be there in just in case she might fall. I find I can’t relate to support communities, becsuse they are so age specific & the carees need more help than I have to give. I do however still have questions & stress. It would be great to find more general support. Maybe I just don’t know where to look. Dr’s could be a GREAT source of information. At least some how through their office. Donna, this is a really important point. Caregiving burdens vary widely. There are times in our lives when caregiving is light/non-existent — when we, our friends, and our family are all in good health. There are times when it the burden is modest — when we are helping someone recover or cope with a mild, “manageable” illness. There are times when it is heavy — when a lot of time and energy and emotional strength is needed, such as caring for an elder in the later stages of Alzheimer’s. And there are times when it is much, much harder — when we ourselves have major illnesses AND are helping multiple family members with their issues. I believe there are opportunities for us to learn “hacks” from each other across these different situations. It would be better to think of caregiving primarily as something we just do, a part of being human, rather than as something that is disease/condition-specific. I’m a geriatrician, so I love your question! I would say that even though your mother sounds very healthy and able for her age, she’s still vulnerable. Part of what we do in geriatrics is modify healthcare so it’s a better fit for that vulnerability (many meds will be riskier, she might have different symptoms when sick than a younger person, etc). Plus your experience of caring for her will still have a lot of overlap with that of people caring for “sicker” older loved ones. So I think it’s good to look for information grounded in the experience of people caring for the elderly. I do not work for them (although I guest-posted once), but I’ve been very impressed by the caregiver forum at AgingCare.com. Very active, and my guess is there are many people in a situation similar to yours: vulnerable older parent who is still very independent. The caregivers there give a lot of good advice and support. Do check out the forum at AgingCare, if you haven’t already. Right now it’s the most active forum I’ve found focusing on “eldercare”. This is the coolest post I’ve seen all year. I’ve just seen Summer Plum (@summerplum on Twitter and Instagram) mention #sickhacks on Instagram. If you search that tag, a bunch of great ideas come up. It’s easy to contribute your own, just add the hashtag #sickhacks. Great stuff here. The importance of peer support and insight from others who have been in a similar position is underrated in the world of increasingly complex treatments, medical guidelines and medication regimens. It’s like doctors forget the human aspect of living with a disease. This is especially evident in cancer care, where the industry is shifting towards protocol driven guidelines, and continues to focus on chemo, radiation, and surgery to treat the disease (slash and burn) while patient needs as people are often overlooked. The LIVESTRONG foundation has started an initiative to crowdsource ideas for tips, tricks, and pieces of advice for how to live in the day to day following diagnosis, treatment, and recovery. It’s called “Cancer hacks” and it’s worth checking out and adding any tips you’ve come across: http://www.cancerhacks.org. thanks for the great post and the ongoing leadership! Hope to catch up in person soon! OK, I love #cancerhacks and am trying not to be embarrassed that I didn’t know about it before. Some of the hacks are so simple, but so useful! And absolutely applicable across conditions. Key points: #cancerhacks is in beta, so there’s room for improvement and Livestrong knows it; search and metadata is paramount for information flow. So glad to see your post! There actually is an Assistive Technology channel on Instructables – it covers healthcare life hacks from low-tech to high. I’ll email you with follow-up. Everyone: Please check out the Instructables.com links and let’s talk about this as an opportunity. What do you think? I think the Instructables.com link is wonderful and it provides 3 easy ways to enter content and then a variety of ways to search for your content (from a technical writing and end user perspective – that’s fantastic!!! )…so I love it. This is such an inspiration. Just…wow. Thank you, everyone, for the fantastic comments so far! Wireless doorbell as a “call button.” Strong magnets to keep doors open (or closed). Garbage bag on car seat; can slide in/out. I also love where some of you have taken the conversation, pointing out places where this kind of work is already happening online or creating new places, new repositories for folk wisdom. Please keep posting examples and ideas. This conversation will never be over — don’t pay attention to the date on the post. If you’ve just come to it, the thread is still open! One. What if there was a way people could issue “support tickets” or some other type of request so that people who are experienced hackers, makers, and designers could submit their ideas and concepts. Sort of like 99Designs does for logo design, but not a monetary marketplace. Two (inspired by this tweet: https://twitter.com/SusannahFox/status/435130650136297472). What if large design firms like IDEO dedicated volunteering time to actually go into people’s homes to help the identify problems and issues. They could then work collaboratively with the individual(s) to design solutions. 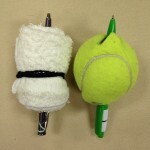 Three: It would be neat to also see something like the Thingaverse: http://www.thingiverse.com/ for these type of hacks. It’s not unrealistic to think that in the near future people will be able to use 3D printers to create one-off solutions. Why not create a unique community of people sharing those ideas? I created a device that allows people with leg weakness to do exercises in bed, safely. It is now used in hospitals, homes, and skilled nursing faciltities. Sometimes I wonder if I should put a warning label on my blog: “The conversation is never over. Subscribe to comments at your peril.” I use this space as an outboard memory, coming back to it for inspiration when I’m writing about the topics later. Click through and you’ll see a poster board showing visitors to a child’s hospital room exactly how to approach this little girl who cannot hear and has very low vision. I love it. Last week, working with friends Denise Brown and Christopher MacLellan, I asked caregivers to describe a day in their lives, to keep a log of everything caregiving-related they did on one day. In a webchat (included in that post), she and her husband Richard commented that they thought their caregiving situation wasn’t that hard, that Robert is generally self-sufficient. Perhaps. But I think that most readers will feel that Trish in fact puts in a huge amount of time, and physical and mental energy into caring for her brother. Thanks, Raj, that was a great discussion to watch — can’t wait to learn more about what you find with those caregiver logs. In return, I’ll share this post featuring a video showing how one man used a large paper wall calendar to track six aspects of his life: evening ritual, fitness, nutrition, learning, sleep, and travel. A low-tech project but it gave him access to deeper insights. Latest find, thanks to my colleague Kathryn Zickuhr: finger splints that look like jewelry. I bet if we looked we would find hundreds (thousands?) of these sorts of lists. Some are more universal, such as how to help a 3-year-old cope with a weekly shot, others are specific to certain conditions, like sun avoidance tips. I’m still dreaming of a hack that would bring all these tips together from across the world, compile them, make them searchable, and then allow people to rate their usefulness. What a great post! As a home care company, we write several articles per week to share on our blog. We send those articles out to those who have opted into our list. We are in the process of putting together an email newsletter, and this article has inspired us to include a caregiver tip section! Here’s another “What if…” that’s worth noting for this group: What if experienced caregiver-makers could vet ideas for newbies? Humble Makers Against Crowdfunding Scams (HMACS), by Paul Spinrad. So, what if there were a loose body of makers, with some recognizable name and “seal of non-disapproval,” who take it upon themselves to vet all of the new hardware offerings posted to crowdfunding sites, and publish a JSON database or similar that associates each one of them with Pass, Fail, Maybe, Notes, Reviewer, etc.? What if there were a few such entities, expert in different domains? In terms of pro bono work, this seems like low-hanging fruit. In a crowd-powered future, so many would benefit so much from something that’s so easy to do. The mirror man: Phantom pain, experienced in missing limbs, tortures amputees and puzzles scientists. Srinath Perur cycles round Cambodia with a man who treats it with mirrors. Example: banana slices are too slippery for someone with poor dexterity to pick up. This thread (and my main thesis) is that we need to do more sharing. We need to bake it into our culture again (or further, depending on your point of view). Sometimes the “technology” will become a product, but often it won’t. It has value either way. How might we enable that caregiver with the notebook to contribute that data to the public good? How might we spread the knowledge she now has? Beautiful. Do you know if other people, such as caregivers for kids with similar issues, have looked at it? And, because every day brings a new tip: A caregiver who taped a yoga mat next to her mother’s bed as an anti-slip mat. Not only is it non-slip, but it’s easy to clean when there are accidents, as happens in the morning trying to get to the commode. over the pass 3 years. So essentially not a lot of traction. In keeping with the theme, here’s another hack: Wanted to share…. Susannah, several months ago a woman got in touch with me. She had kept extensive health records regarding her mother. Her mother is now deceased and this daughter wanted to donate her mother’s information, because I had blogged about the need for developers to consider more complicated medical situations when they design consumer tools. But when I asked around, there was no clear safe way to facilitate such a donation of information. Eventually, I hope we’ll have spaces where it’s easy for patients and caregivers to share or donate their information, so that it can serve the public and community’s interest. Wonderful to hear that the woman you mention is thinking of volunteering at the senior center…she’ll be able to help a lot of people get more of what they need from their healthcare encounters. If you’re still following this conversation (thanks!) please keep posting what you see. I joke that I have “spies everywhere” but really, it’s crowd — our community — that I count on. Together we cover the globe, looking for examples of peer-to-peer health care. Great post! I am currently caring for my mom with dementia (with the help of part time aids). I started 2.5 yrs ago when my dad seriously hurt his back while trying to lift my mom off the floor. He passed a year and a half ago. +a driveway alarm. $20 at a hardware store. Put the infra red beam in line of caree’s (great word!) feet where they would land of they were to get out of bed. The chime part is portable and signals that they’re getting up. +baby monitor…if mom just wants something, she speaks it (when she remembers ). Also I can monitor her breathing , restlessness, etc. +large rubber backed entryway dirt catching rug. It’s beveled rubber edges lay flat in front of their bed and the grooved pile provides traction whike getting up on wobbly mornings. Any toilet in accidents can be scrubbed + hosed off …or simply replace. +children’s word find books (or what ever is preferred) is “meaningful work” from my mom’s perspective. I tell her they need to be done, but would she help out me by doing them. +leak proof mattress protector- buy a segmented one, and put on top of fitted sheet not below. Can be washed as needed, giving just a bit more time in between bed changes if you get busy. That’s what I can think of for now. Love the ideas, links, and everything! Thank you! Janice, thank you for sharing these wonderful ideas! My apologies for the slow reply — this came in while I was on holiday. I’m so happy you found this blog and shared your hacks. I found it easiest to make the first piercing cut with a box cutter and use that blade to saw a slit. I then used some very strong, sharp shears to make the cross cut. I just want to say that all the information you have given here is awesome. Thank you.